It’s a dreary Tuesday afternoon and the Samjhauta Express has chugged out of Attari railway station a few hours ago. This is the only train service connecting India with its neighbour Pakistan, and Attari – 3km from the border at Wagah – is the last Indian town before you cross over. We’re in the parking lot of this notable station, answering the relentless questions of the railway authorities, policemen and locals. Did these people catch us sneaking into Pakistan? No. We’ve travelled to Attari to check out this railway line that connects the two great nations. 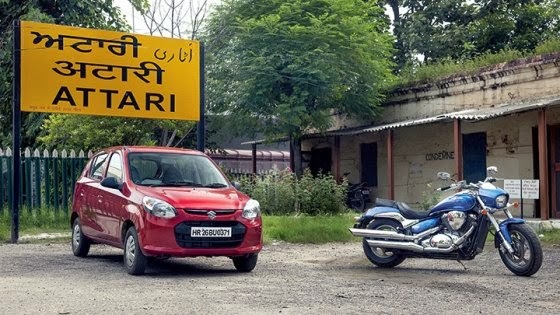 On the one hand, we’re disappointed that we couldn’t catch a glimpse of the iconic train; on the other hand, the entourage of policemen and authorities we’re thrilled to check out our transport – a Maruti Alto 800 and a Suzuki Intruder M800. We’re grilled about every minute detail, and most of the guys are amazed that both vehicles are powered by engines of similar cubic capacity. A villager asks if they both have the same engine. The answer is a big “no”.